Scottish financier and speculator; founded Banque Générale in 1716, the first bank of any kind in France which issued paper currency and prospered; created for the development and colonization of Louisiana in 1717 the Mississippi Scheme; fled on collapse of the Scheme due to overissue of paper currency and hostile government action (1720). 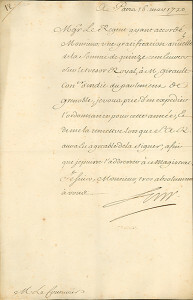 Letter Signed, one page, legal folio, Paris, May 16, 1720. In French, to Mr. Coutuvier. With integral docketed leaf attached. Five days after this letter was written, John Law’s financial empire was brought to ruin. The great Mississippi Scheme, which he founded in August 1717 under the aegis of the Western Company, had brought to France a massive expansion of credit which contributed to a sudden and phenomenal inflation as well as a speculative mania in shares. Within two years of its creation, the Compagnie des Indes, as it was now called, had absorbed the East India and China companies, the African Company, and the mint. By the time Law completed the Scheme with the Royal Bank merger on February 23, 1720, a reaction had inevitably set in. “The successful speculators in the shares of the company had begun to realise their gains, and to drain the bank of coin in exchange for their paper-money. [Dictionary of National Biography].” John Law took several steps, enforced by royal decrees, to check this movement during the early months of 1720, but they were ineffective: “The value of the metallic currency was made to fluctuate. Payments in specie for any but limited amounts were forbidden. The possession of more than five hundred livres in specie was punished by confiscation and a heavy fine, and domiciliary visits were paid to insure the enforced transmission of specie to the mint…. Investments in the purchase of commodities was the last expedient tried, and it increased the already enormous prices due to a superabundant paper currency, which were paralysing trade and industry and exciting popular discontent [DNB]”. 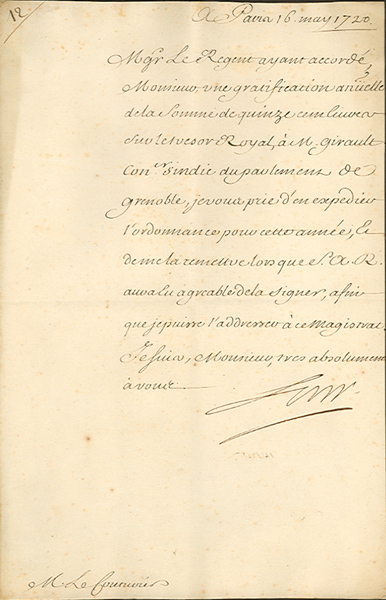 On May 21, 1720, the Duc d’Orleans, the Regent of France, decreed the devaluation of both money and shares. It is thought by some that he acted on Law’s advice; but the measure could only spell doom for the Mississippi Company. “A bank-note representing 100 livres on May 21 was to be worth 80 livres on July 1; it was to be lowered in value by degrees until the end of the year when it would be worth only 50 livres. In the same way, the Mississippi Company’s shares were to be reduced in value from 9,000 livres to 5,000 livres” [Hyde, John Law]. Holders of both notes and shares rushed to convert them to more substantial assets; and on a hot day in July, while 15,000 people waited at the doors of the bank, sixteen were killed in the crush. John Law took refuge in the Palais Royal, in constant fear of his life, and struggled to save the Company. The power of his enemies was too great, however, and he was forced to leave the country in December. The bulk of his fortune, having been invested in French estates, was immediately confiscated.